Sorrel is one of my favourite vegetables. It's a perennial vegetable, which means in hard winters it will come back the following Spring, and in mild winters as the one past has been, you can continue to harvest, though less often, throughout. 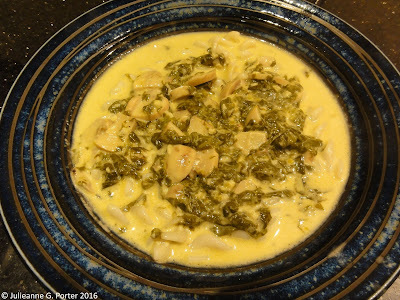 It can be used just like spinach or chard, but I think it's even yummier than those, with it's lemony tang. A lot of people forage for sorrel at this time of year, when it's new leaves are fresh. If you grow it yourself you can continue to harvest most, if not all, year long. 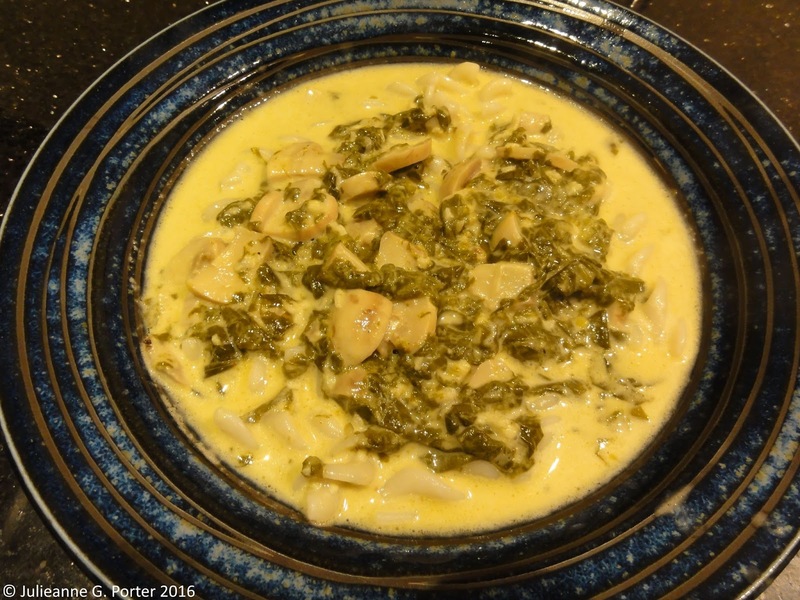 This recipe is based on the classic French sorrel sauce, but adapted because I thought it would work with mushrooms and nutmeg. I've cooked this in both single and multiple batches (double, triple amounts etc) and it tastes just as good the second night. You just need to cook some fresh pasta and heat up the sauce the second night. And no, this isn't going to turn into a cooking blog. It's just that after a conversation I had with other gardeners a couple of weeks ago, it was suggested that it would be good if the recipe could be published. So try it and see what you think. 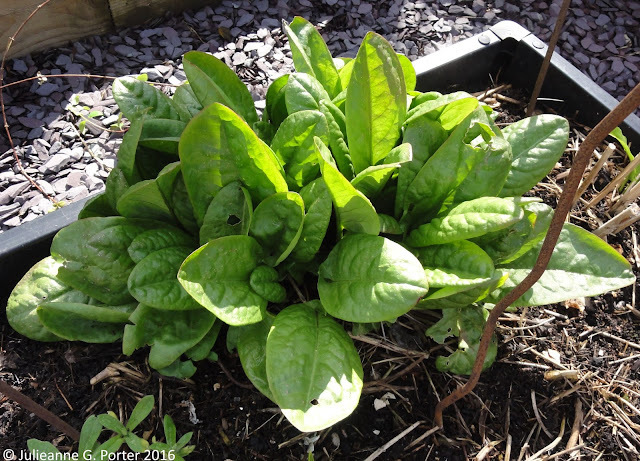 If you would like to grow your own sorrel, I got mine (a non-flowering form of Rumex acetosa) from Alison Tindale of Backyard Larder. 1. Cut up the sorrel by curling up a few leaves at a time and slicing them very thin. 3. Put on the water for the pasta and start cooking it. 4. Pour the cream in a small pot and bring it to a simmer slowly. Doing this will prevent it from curdling when it hits all that acidic sorrel in a few minutes. 5. Meanwhile, in another small to medium pot, heat the butter, garlic and nutmeg over medium heat and add the sorrel. 6. As the sorrel stars cooking, add in the mushrooms and stir often. 7. When the sorrel has cooked down (i.e. turned an Army green), stir in the cream and bring the sauce to a bare simmer. It can get thick, so add the stock to thin it out. You can add more stock if you want the sauce even thinner. 8. Taste the sauce and add a little extra nutmeg if you don’t like it too lemony. 9. When the pasta is cooked, portion it out on plates. Add the sorrel and mushroom sauce on top, then serve. *the amount of pasta is based on keeping the carbs down. If that isn’t an issue for you, then add more pasta. There will be enough sauce for a larger serving of pasta. I use a gluten-free Rice and Millet spiral pasta, but wheat-based spirals or penne would work just as well. I'll have to try the creme fraiche version. I'll let you know how it goes. Sounds great – I've got some sorrel growing in the garden so I'll have to give it a try. That sounds wonderful, must give it a try! Looks very tasty Julieanne. Personally I don't like creamy sauces but will print this up for my brother - this recipe is just up his street.